It takes a lot of chipping away at the crust of Shaw’s play to reveal the original underneath the melodrama that Hollywood has imposed on it, notably in the form of My Fair Lady. Even in Shaw’s own day there were attempts to turn it into a rom-com for the masses. But in this production the Royal Exchange has rediscovered a jewel of English (or should that be Irish?) theatre. Faithful to the text, it is Shaw at his painfully funniest and most philosophically astute, and appeals to the sense we have of reinventing ourselves. Of course, for Shaw the idea of reinvention is based on class and he directs his arrow at its fault line, language and manners. Professor Henry Higgins takes a bet that he can transform flower girl Eliza Doolittle from a Cockernee girl into a duchess within six months. The production reeks of the sweat and swirl of London, materialised in the form of Eliza’s dad, Alfred Doolittle, who calls on Higgins to pay him off as one of the undeserving poor. Ian Bartholomew gives a bravura performance which sees him literally spit his words out and which deservedly won him a spontaneous round of applause. Simon Robson as Higgins gives off the air of a mad professor to whom Eliza is simply another experiment – no hint here of any supposed romance between the two that cinema versions preferred. As for Eliza herself, Cush Jumbo metamorphoses from a blubbering jumble of petticoats with ‘kerbstone English’ into a paragon of upper class manners whom Higgins himself cannot quite believe is real. As with any transformation, though, something of one’s essence is always left behind and there is a rim of tragedy to Shaw’s heroine. For all his output, Shaw only left us three or four really good plays. 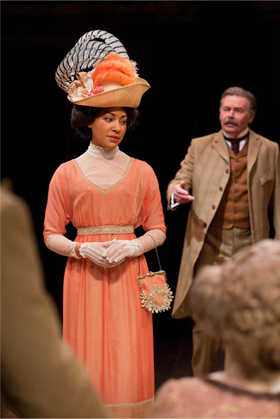 Suffice to say, Pygmalion is one of them, and this production is a great production of it. Shaw is often criticised for writing plays which are only a vehicle for his ideas and while this production clearly addresses the problem of fluid identity in a society that judges by appearance – as true today as in his time – it is also very funny. On a steamy Saturday night a full house enjoyed a sparkling production of a play that has been neglected in light of the musical film 'My Fair Lady'. 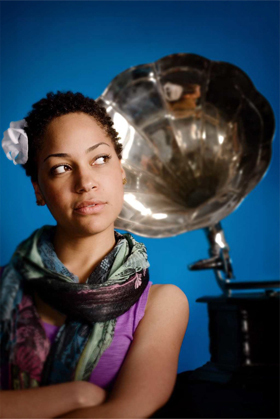 The cast includes some familiar television and Royal Exchange faces, but the star is Cush Jumbo – who successfully portrays both the flower girl and the transformed 'lady' who realises that she has lost her independence and identity while gaining a wonderful wardrobe and flawless diction. She is matched by Simon Robson in the eccentric Professor Higgins – who moves from seeing Eliza as an experiment for his linguistic theories to a real human being with feelings and desires. He successfully negotiates some of Shaw's most demanding speeches and brings a humanity to a part that can seem cold. I would love to see him in 'Man and Superman' as another of Shaw's didactic heroes. The supporting cast, notably Ian Bartholomew as Eliza's father, are equally entertaining and the whole production is beautifully costumed – great hats – and produced. Unlike the film version the ending is left unresolved although we can imagine that Higgins and Eliza will have a life together it will certainly not be a conventional relationship – the Professor has not only created a lady, but a woman.